Our 30% over injector kit includes everything that you would normally need to upgrade your fuel injectors. The 30% over upgrade typically yields around a 70HP increase on an otherwise stock truck. Many customers also report better fuel economy, although this varies with driving patterns. With additional modifications such as a performance tuner, this 6.0 Powerstroke Performance Injector Nozzle Kit will support much higher horsepower levels. The 30% over modification is very popular - those customers we have spoken to love the way their truck drives with it. The included injector holding fixture is essential to completing the installation of the injector nozzles in a professional manner. We recommend torquing the lower injector body to 65ft-lbs. 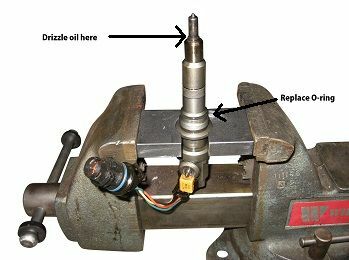 Any attempt to hold the injector without a proper fixture while reaching this torque figure is very likely to severely damage the injector. See picture below for correct use of fixture.